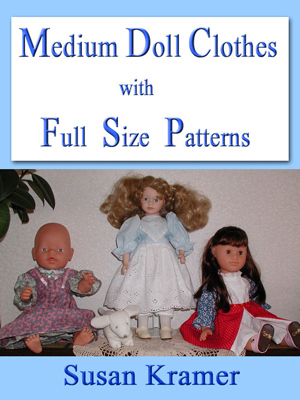 Full size patterns for clothes to fit 18 inch American Girl, Corolle, Gotz, Precious Day Dolls; 14-17 inch baby dolls like Bitty Baby, Gotz Maxi Muffin and Zapf Baby Born; and 16-18 inch dolls like Sasha, Kathe Kruse play dolls, and Magic Attic. Directions throughout the text are given in both centimeters and inches. Full size patterns ready to cut out and use in .pdf and trace in paperback. Sewing instructions, and photos of finished outfits. I think you'll be able to tell by the variety of patterns included that I really love designing for my dolls. This has been a lifelong obsession beginning with using scraps of fabric from my mother's own sewing projects. And a special treat was to use the washed and pressed flour sacks of rough cotton. But I made use of everything and it goes to show that because doll clothes don't need big pieces of material that you probably can put together an entire wardrobe for your dolls from what you have on hand. 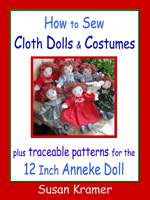 Front cover shows finished doll outfits from the full size patterns. About the author - Susan Kramer has been teaching meditation, yoga, dance and academics kinesthetically as a dance specialist since 1965 and maintains a large educational web site at susankramer.com. 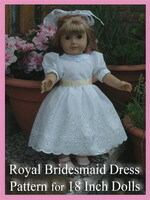 Sewing, quilting and doll making have been long-time hobbies. Content copyright Susan Kramer 2005-2015. All rights reserved.